Soy beans skins need be removed for making tempeh, since the starter spores have difficulty penetrating the soy beans with shell (skins) in place. The skins are firmly in place and must be loosened before they can be removed using agitation. Process is to: wash the beans, soak in cold water for 12 hours, agitate the beans by rubbing between hands, rinse the water carefully to separate the beans from the skins which partially float. Depending upon the time expended most of the skins will be removed. It is desirable that the beans spit but this is not essential. Soaking increases the volume by doubling.This is the first operation for making Tempeh. Another method of removing skins is: Do not soak. Boil the raw soy beans for 45 minutes. Cool under cold water, and rub the beans between the hands. Pour off the floating skins several times into a colander. This works reasonably well. 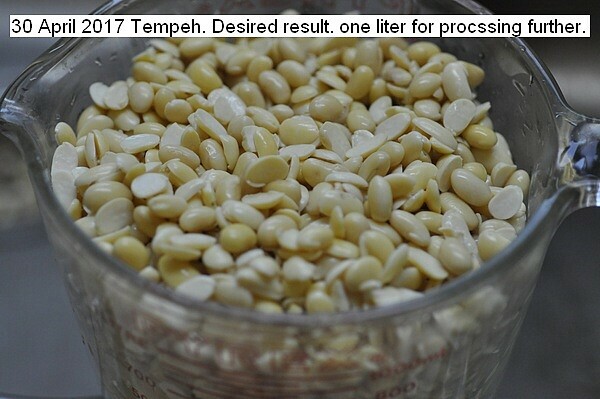 This entry was posted in Uncategorized and tagged 30 April 2017 Tempeh: Removing soy bean skins, Removing soy bean skins, Tempeh: Removing soy bean skins. Bookmark the permalink.